I love snow - it seems to insulate trees and wildlife from the cold temps. This year it's so cold the trees have to hug themselves and are shivering to keep warm! What got me going on this was burning or melting polyester sheer fabrics. You CAREFULLY take your fabric, in my case strips of brown sheer and hold it over (not in) a candle flame. Hover over the flame until it starts to melt and curl. Keep a bowl of water handy because it probablly will catch on fire but just blow it out or dunk it. 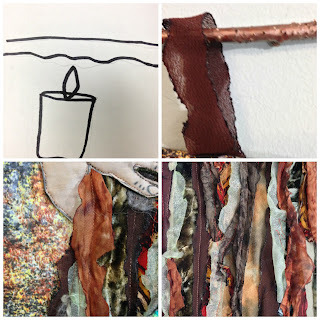 Not all fabrics will melt - some will just catch on fire but the ones that do curl and or get this beatiful torn edge effect. It must be polyester and I seem to have the best luck with sheer fabrics so keep that in mind if you try this. So to make my tree I first cut a tree like trunk and laid out some velvety strips down first and then kept adding more and more, using the melted and burnt strips, sewing them down as I went. First I tried glueing them down but the poly sheers do not stick well so, sew it down I did. I found a background that was muted and no snow winter looking and laid that out. The hands were first sketched out with pencil and then a fine black sharpie. Fusible pressed to the back, paper taken off and then pressed to a wool felt. In hindsight I should not have used the felt. 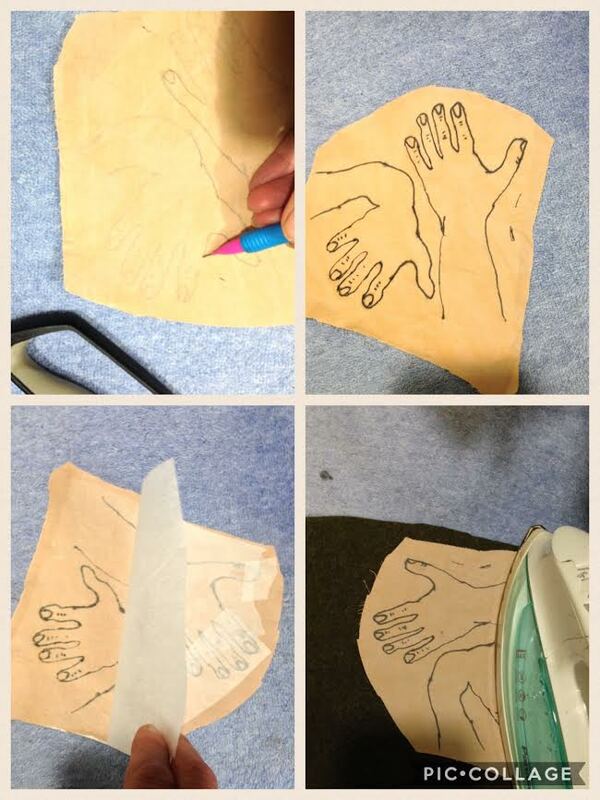 It made the hands to thick and the dark felt shows to much if you look closely at the hands. The face is a purchased fabric that has faces already painted on so I traced around the head to get the size for the hole and cut it out. Then placed the hands and pinned down for quilting. The hole ended up being to big - mistake? Hell no! 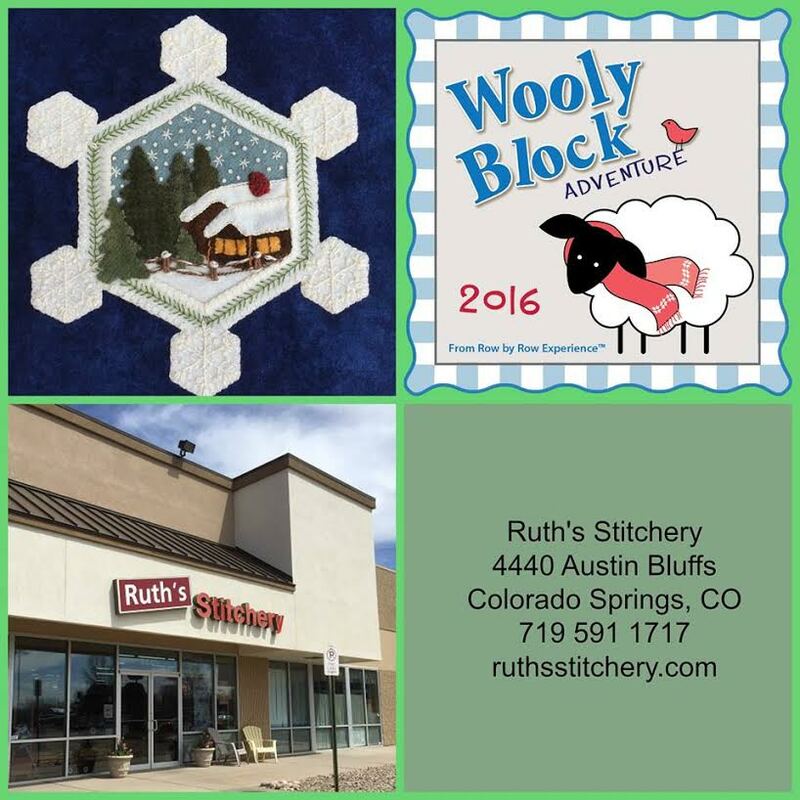 Not in art quilting land! I then proceeded to add to that face area that was to big - all kinds of funky yarns and wool fibers that I have in my stash. All of this was sewn down on my sewing machine and the hands were sewn down as well. The background was free motion quilted and a facing was added to finish. I love how he came out and thank you to Marian at Seams to be Sewn for having the blog hop or this tree hugger may never have been born. Click on the button on the top right of this blog to go see the other bloggers for today. this may be the only way to see snow this year is to make it - lol! OMGosh! 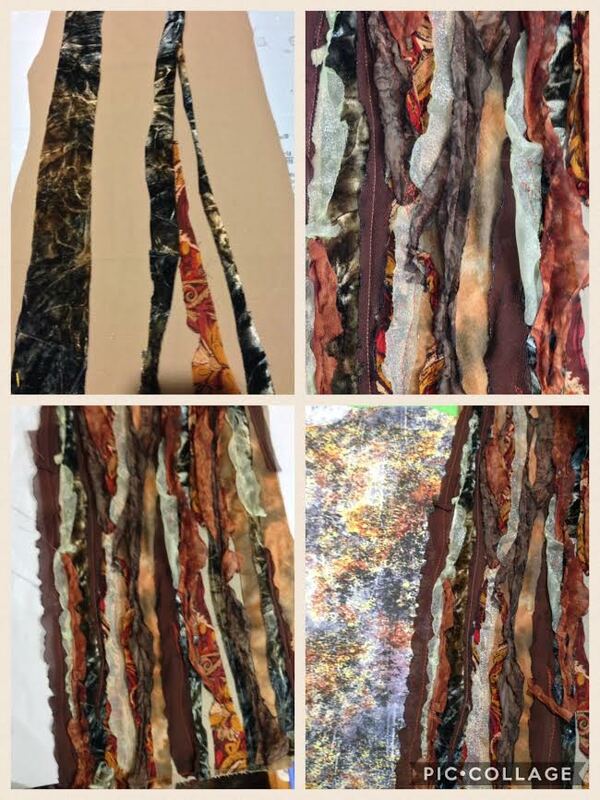 What great sight you have in taking those fabric strips and creating this great tree bark. I love this entire piece. But of COURSE that hair was an accident went right! lol. WOW! This is definitely an art quilt to cherish! I love all of it. The face is sooo cute--no mistakes about it at all with all the hair. Thank you for sharing today. What a fantastic idea!!! Your technique unique & inspiring. Thanks for walking thru the steps. Two thumbs up!! Incredible project. Thanks for sharing your tips and inspiration. WoW, that technique really worked out well, and I love love LOVE the end result.. Thanks for sharing with us how you did that and going thru each part, I really enjoyed it and I love the wallhanging. wow, this is fantastic. love your fix around the face. It was so interesting to read about the prosess of making this! Very nice use of alternate materials. I like the way you heated the polyester to shape it. Thanks for sharing. OMG, this is just fantastic. I have always said I was going to art quilt. I've bought more "stuff" that I will likely ever use for it, but wow, this really inspires me. Love your post... your my kind of girl! LOL!!!!! This is really a cute idea! already I am thinking of different things I can do with it. Thanks! What an amazing quilt! Thanks for showing us your process too! Love your project! I am not an arty person so mostly use only cotton fabrics. This is absolutely beautiful and unique! Very interesting. I have got to get more adventurous with fabric. Wow I love your tree hugger piece. Thank you so much for showing your process! 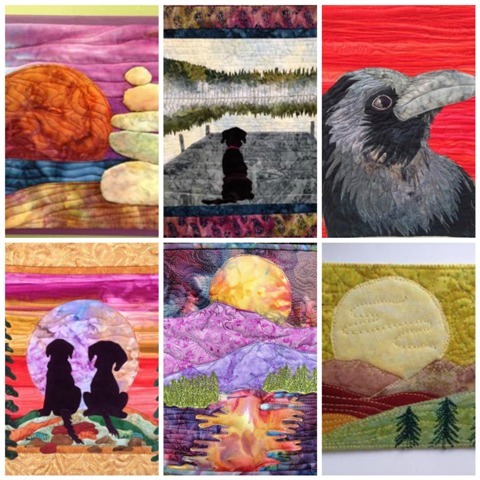 What a wonderfully artistic quilt! Thank you for the instructions on how you went about each step, it makes you appreciate it that much more. This piece is amazing, love it! You are an artist! OMG - this is awesome! Thanks for sharing it. What a cool effect for tree bark. Cotton burns, and polyester melts, since it is synthetic. Thank goodness for classes in textiles and organic chemistry as part of my Home Ec Ed training. Wow! This is so creative and it looks wonderful! If it's not fun,what's the point?